September 18, 2012: Samrat, Next Role? Jenny K: The summer’s been slow for writing about film, but not, thank goodness, for the viewing. Though I blench to admit it, I’ve succumbed to the national fascination with downloadable films. I want to see it, and I want to see it NOW!!! Patience is a thing of the past and Netflix is my main enabler. I watched four films in an embarrassingly short amount of time, and though they were not all Indian language films, they were all linked by the presence of one desi actor, Samrat Chakrabarti, so I thought this week merited a full Samrat-centric post. Julie M: I’m afraid of Netflix. I’m afraid that my life will no longer be my own if I had immediate access to anything I wanted to see! But back to Samrat. Jenny K: Now I knew who he was. I’d even met him before at a film festival in NYC when he was promoting one of his films. But until I saw The Waiting City (2009) at my buddy Pat’s insistence, I had no idea how versatile an actor he was. And he’s practically chameleon-like, he so disappears into any role he takes. The Waiting City is about an Australian couple (played by Radha Mitchell and Joel Edgerton) who go to Kolkata to adopt a little girl, and hopefully in doing so save their marriage…though neither of them were admitting that they were on the edge of collapse when they left Oz. The paperwork involved in the transferal of little Laxmi from the orphanage takes (shock!) longer than they had been led to believe, and the two are left in the capable hands of Krishna (Samrat) their cab-driver-and-jack-of-all-trades. I couldn’t believe the credits; I didn’t even recognize Samrat as the same light comedian who deftly beat-boxed his way through Loins of Punjab Presents. But it was more than the obvious change of hair and wardrobe; Samrat slipped so easily into the cadences and mannerisms of a working-class guy in the city, filled with the gentle wisdom of a simple man, that he rapidly became the hero of the piece for me. This one’s definitely worth a watch. Julie M: I find it weird that the trailer doesn’t even credit him, and only really highlights his voice at the beginning, for all that you say he’s an important part of the film. But I really enjoyed the way Kolkata becomes a character in the narrative…at least it seems so from the trailer. Jenny K: Well, he’s not, technically the focus of the story, but these two Aussies are babes in the woods in Kolkata, both in matters of bureaucracy and communication. And I don’t mean just with the adoption board…he becomes the facilitator for many of the ways that these two people come to relate to each other. Sort of their guru for this trip, in a way. Julie M: I meant to watch a film tonight, myself, since B is out of town, but got caught up mid-afternoon preparing a lecture and before I knew it, it was midnight and I still hadn’t finished. Darn! Well, once it gets cold out I will stop exercising outside and switch to the indoor bike, and will start watching films in 1/2-hour installments again to entertain myself. But I did see Kahaani courtesy of my lovely library and LOVED it. I’m a thriller nut anyway, and this was satisfyingly mysterious, thrilling and twisty. Vidya Balan is my favorite leading actress right now and I can’t wait for her next release, which apparently is not until next year! Jenny K: Well, you’ll just have to go back and watch her in Parineeta with Saif, from 2005. You haven’t seen that yet, have you? It was her first film. The Waiting City led me to IMDb to find out what else Samrat had done, which linked to his website and his show reel. Pretty cool…proves my observation that the performances are so different, that it looks like the work of different men! Afterwards, I began to scour Netflix and Amazon download in earnest for more examples of Samrat’s work. 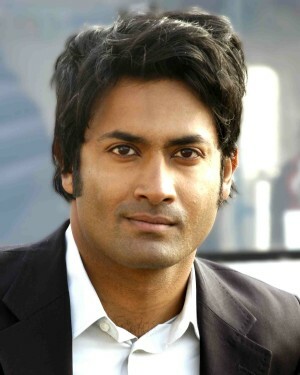 First up was one of the light comedies that he seems to specialize in…Kissing Cousins (2008) a ninety-eight-minute fluff piece that gives you a reverse Hitch, with Samrat playing a professional break-up guy on the LA scene, hireable by those too cowardly to break up with their significant others in person. This job has soured him on romance in the extreme and his all too “coupled” friends think he will never get his own healthy dating life. He is rescued by accident on an impromptu trip home to visit his folks in SanFran that involves a reunion with his feisty cousin Zara from England (Rebecca Hazlewood of NBC’s late, occasionally lamented Outsourced) who goes home with him to sightsee in LA. Hilarity and confusion abound when she spontaneously steps in as his pretend girlfriend, allowing him to save face with his friends. Samrat’s acting is smooth here, with a nice light comedic touch, and a much more stylish avatar than in TWC. Now, I realized, sort of after the fact that I should have been a bit shocked with the subject matter, at a drunken heavy groping session between relatives, et al, but, I wasn’t, perhaps due to the deftness of these actors’ portrayals. Plus, the film itself wasn’t completely predictable. It didn’t end in either the way the trailer teases you it will, or the way I expected it to. So, verdict: nice timepass, albeit with a bit of crudeness here and there between the guy-pals that I could have done without. On Youtube, here. Julie M: Didn’t his redheaded friend look just like a white version of Samrat? Or am I just tired? Jenny K: Hmmm…could be exhaustion, I didn’t pick up on that resemblance. The final film in my Samrat Trifecta was Bombay Summer (2009). We’re back in a serious mode again, with Samrat playing a young yuppie writer struggling to find his voice in his first grown-up apartment, away from his parents. However, he spends less time writing and more time canoodling with his girlfriend Tanishtha Chatterjee (finally in a film not set in the country! ), who is just as compelling as I’ve come to expect. Julie M: I’m a huge Tannishtha fan. Loved her in Road, Movie and Brick Lane. This film seems a bit self-indulgent for me to truly enjoy (a writer writing a film about a writer with personal problems…spare me!) but I’d watch it for her performance alone. Jenny K: Don’t write it off on that impression, because it is definitely more than that. And if it’s autobiographical, the writer in question (also the film’s director) Joseph Mathew doesn’t cut himself very much slack. 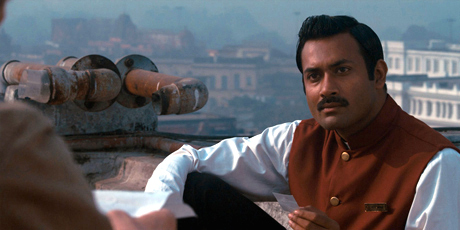 His character, Jaidev, doesn’t come across as particularly endearing. In fact, all of the characters in this film have their grey areas, and it gives layers to the film that really enrich it. Tannishtha plays Geeta, a young woman who comes from a very affluent family, but who is supporting herself as a publisher…she is hiding her relationship with Jaidev from her father (or trying to) while Jaidev is doing the same thing with his parents. His mother is desperate to get him to come home to Mummy and Daddy who would love to smooth his way into authordom for him. Meanwhile the spoke that is stuck into the wheel of their relationship is a lower-caste artist, Madan (a quite charismatic Jatin Gaswami) who applies for a job doing covers for her publishing firm. Tannishtha takes him under her wing, and the three of them start hanging out together, the Three Musketeers, visiting Madan’s idyllic village and his lovely mother, taking photos together, visiting inspiring ruins and beaches, etc…They get so close, in fact, that disaster must happen. And it does…as in 2010’s Dhobi Ghat: Mumbai Diaries, Bombay Summer paints a very interesting and involving story of a city and three mismatched modern Mumbaikars, struggling with dreams of success and art, love and lust, philanthropy and patronism…and does it a bit more successfully than does the Aamir Khan starrer. Perhaps it’s just that the stories in this earlier film are more closely linked than in Dhobi Ghat which, at least in the first half of the film seem almost an anthology of separate life stories. More is spelled out here, except perhaps, in details at the very end…where it leaves some things hanging a bit more than I’d like. Everyone involved in this one did a great job. As I mentioned before, Samrat played his character without vanity, not needing us to like him, just to understand him. Tannishtha gave a lovely, delicately emotional performance. And Jatin is someone that I’d like to see again. Very charismatic. This may motivate my next mini-filmfest! Only two films in his IMDb list…but the one that is coming up, Baromas, looks just up your alley…serious Cain and Abel thing goin’ on complete with politics and protests…and Seema Biswas! How can it miss? It’s coming out later this year. Julie M: Oh, yeah, Baromas is definitely on the “anticipated” list now. Thanks for alerting me! Too much to see, too little time…!!! Jenny K: And thank you Samrat Chakrabarti, for doing what you do so well with such skill, honesty and heart. In any type of role he takes, he’s going to give us 110 %. I will look forward to whatever comes up next.